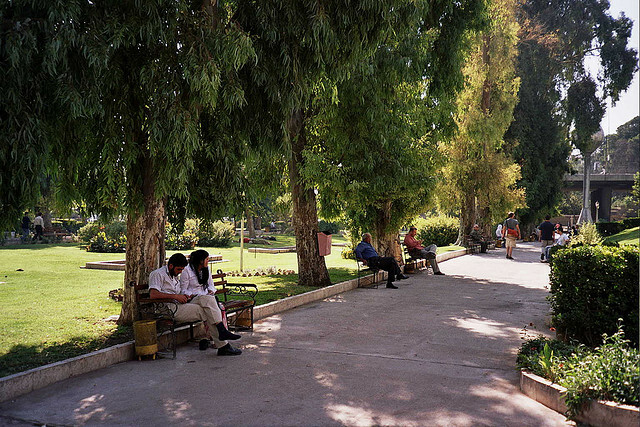 In the park outside our house in Damascus, Syria, new families regularly come to sleep for a couple nights before being escorted away. The few belongings they keep themselves with; blankets, clothes and plastic cups, are being hauled away at the same time. Where do they go? To the temporary camps in schools or mosques? Will they be one of the families living in unfinished buildings, without electricity or water, with no protection from strangers? One afternoon when I was meeting up with a friend, a teenage girl saw us walking on the street. She came up, asking for money. After a couple of weeks here I have improved my skills in saying no. And if I gave to someone living close to me, I might be harassed every day. “Ahmed!” the girl called out and a little boy, maybe 5 years old, ran between us. He didn’t look like the kids I usually saw sleeping in the parks, he was different: even though being barefoot he easily crossed the pebbly street, and no adults were to be seen around. When being approached by kids in other cities, I sometimes ask: “Why are you on the street like this? Why are you not with your mom?” That usually makes them back off, feeling a bit ashamed of their parents sending them out to beg. But I had a feeling that wouldn’t take effect here. The girl was dressed like an adult even though she recently must have entered her teens. Her long dress was ripped, her black scarf hung loosely around her head, displaying her hair, as if she didn’t care anymore. “They have been in our house too, banging the doors, screaming for money,” my friend told me. I freed myself from his grip and turned around. We tried to speed up the pace to get away. After a few steps, stones and other small things started falling down on us. “Khallas!” (Stop it!) I yelled to the one closest to me, it was the girl that had ran up behind us. More stones came swirling through the air, the boy had catched up with my friend and suddenly struck her in the back. “Hey!” she turned around and raised her hand, appearing a bit stronger than I had. First then the kids slowed down, but they didn’t stop. It wasn’t until then that I realized they were not afraid of being hit. The girl already had traces of a black eye and scratches in her face. After a while the children seemed to lose the energy to harass us. They stopped, only throwing some small sticks at us as we left the park. Later that day I saw them again, this time accompanied by two other children. The little group followed people on the street, pulled their clothes, pulled an old woman’s long robe. They received nothing from no one. In a state of conflict, no one is willing to give up whatever little they could spare. One of the boys was now being dragged along the sideway by an older girl, she half carried him. He was beyond tired; exhausted. Another boy, maybe 11 or 12, carried a long stick, violently swinging it back and forth. One man yelled at them, others got scared by the boy and his stick, and crossed the street. … I’ve seen those same kids in Cairo…in Aswan… in Morocco, in Romania….. in Spain… but at least they had some hope. Even a hope of stealing smthg. Damned wars. Damned rulers. Oh that is so sad, we have no idea.